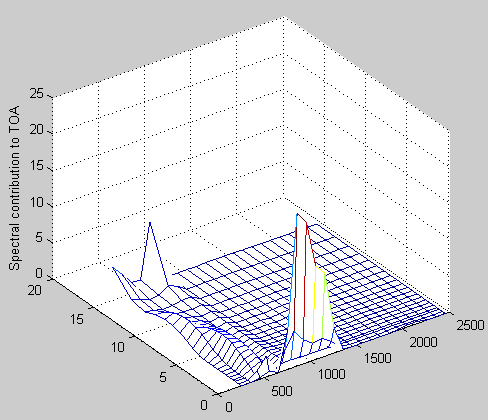 The MATLAB program for the previous articles in this series is attached as a .doc file. Update Jan 24th of the HITRAN data files – these were .par files, but WordPress only allows certain file types to be uploaded. To use them with the Matlab program, save and rename each to .par. Each file is the line data for one molecule, with the number corresponding to its HITRAN number (see the papers in the references). The code for the main function is pasted inline at the end of the article for casual perusal. But WordPress doesn’t format it particularly well, so load it up and look at it in a text editor if you want to understand it. In MATLAB it’s easy to see the code vs comments (%..) because the color is changed. Not so easy in a text editor unless you have a clever one. 1. The variables on the left of the function start – vt tau stau fluxu fluxd ztropo z dz p rho mixh2o zb pb Tb rhob Tinit T radu radd rads radu1 emitu TOAf TOAtr – are variables being brought back. Some are important, some are for checking, some are curiosity value. The variables on the right – dv, numz, mix, blp, BLH, FTH, contabs, Ts, lapsekm, minp, tstep, nt, ploton – are the inputs to the function. Some are vectors (MATLAB is fine with x being a number or a 1d vector or a 2d matrix etc). The function is called either from the command line or from another program adjusting parameters each time and re-running. ‘…’ at the end of line links to the next line (to keep readability). Vectors can be multiplied together to get the dot product or to get a1b1, a2b2, a3b3 as a new vector. It’s the hardest thing to get used to in Matlab when you have been used to indexing everything, e.g., for i=1 to n; c(i)=a(i)*b(i); end – ask if you want to know what a specific line does. 2. Read HITRAN database for the relevant wavenumbers and molecules – to get line strength, position, air-broadening and temperature exponent (line width changes with pressure & temperature). 3. a) i) Create a high res atmosphere from surface temperature, lapse rate and pressure of tropopause – with isothermal stratosphere. Pressure is calculated from ideal gas law. 4. Calculate optical thickness for each layer at each wavenumber. dv defines the spacing for the calculation. 5. Initialize surface upwards radiation from temperature of surface & emissivity, downward from TOA to be zero. Calculate transmission through each layer plus emission from each layer to get spectrum at each boundary in both directions. The above values are for each wavenumber. 6. 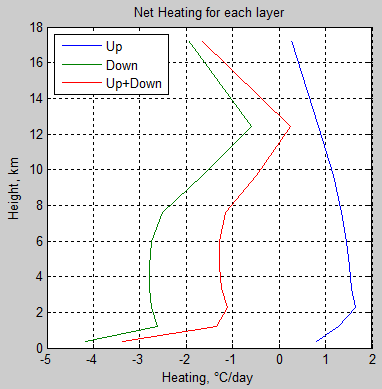 If more than tstep>2 the change in temperature will be calculated at each layer from change in energy. dT = (change in upward flux through layer + change in downward flux through layer) x timestep / (rho x cp x thickness of layer). It’s just the first law of thermodynamics. Then convective adjustment checks whether the lapse rate is too great, which is unstable, and if so, adjusts the temperature back to the lapse rate. This critical lapse rate can be different at different heights, currently it is set to one value. % are needed ptropo & iztropo needed – not defined with std atmospheres? % significantly, should the pressure be re-adjusted? if convadj==true % if convective adjustment chosen..
% if 1st or middle timestep, or just before & after change in GHGs..
We’ve looked, via the model, at how radiation travels through, and interacts with, the atmosphere. But this has been for one set of atmospheric conditions which are listed in Part Two. Water vapor is the most important atmospheric “greenhouse” gas. But its effect on the surface radiation and TOA radiation are quite complex. I ran the model described in Part Two many times, changing the boundary layer humidity (BLH), the free tropospheric humidity (FTH) and the surface temperature. I could plot some more comparisons with different FTH values, but regardless of the FTH value the graphs of TOA flux vs BLH have the same characteristics. Why, if water vapor is such a strong GHG, does the top of atmosphere radiation stay almost the same for a boundary layer almost dry through to completely saturated? The reason is simple. The surface is emitting a blackbody radiation spectrum for that surface temperature (see note 2 in Part Two). The boundary layer is at almost the same temperature as the surface (2-3K difference in this case) so at a given wavelength radiation either gets transmitted, or gets absorbed and re-emitted (usually a combination). But if re-emitted, it is at almost the same temperature as the surface. The radiative transfer equations show us that the change in flux as radiation travels through a body is caused by the difference between the temperature of the source of the radiation and the temperature of the body in question. This is explained a little more in Part Two and is an essential point to grasp. 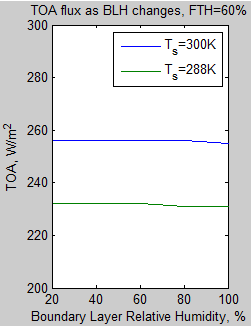 So the upward radiation at TOA is the almost the same whether the boundary layer is saturated or dry. But the surface DLR experiences a big difference as the boundary layer moisture changes. The reason why should be obvious by now, but this subject is quite difficult to take in when you are new to it. What downward radiation is incident on the boundary layer from above? The answer is – nothing like as much as is incident on the boundary layer from below. The downward atmospheric radiation on this boundary layer is just the emission from the various GHGs (water vapor, CO2, O3, etc) and the water vapor concentration above is quite a lot lower than the boundary layer. When the boundary layer is saturated with water vapor it emits very strongly across many bands. 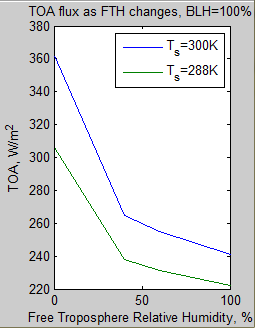 So the humidity of the boundary layer has a big impact on the DLR, but very little on the TOA outgoing radiation. So now as the atmosphere above the boundary layer gets more water vapor it absorbs (and re-emits) more strongly. But the re-emission is from colder layers of the atmosphere so as this GHG increases in concentration up through the atmosphere, the TOA radiation reduces significantly. And if we reduce the outgoing radiation from the planet then, all other things being equal, the planet warms. We can see that in the center of the CO2 band (600-700 cm-1) there is zero change between the two cases at all heights – as expected. Even though the boundary layer is saturated, changes in water vapor above this layer still have a significant impact on the surface DLR. The dark blue curve is the one we are measuring at the surface. The top right is the difference between the two cases at four different heights. 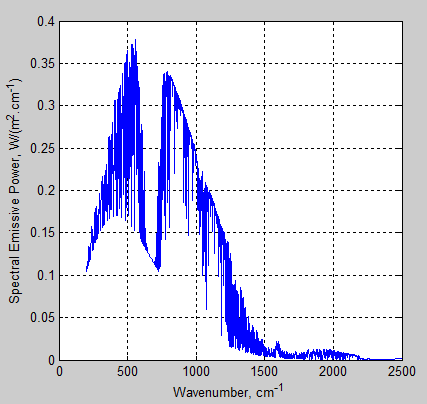 The bottom right shows only the difference in spectra at the surface (it is hard to see it in the top right graph). What is clear is that the difference is caused by the “mid-strength” absorbing/emitting “atmospheric window around 800-1200 cm-1. The “background” DLR from the very top of atmosphere is of course zero (see figure 6 in Part Two). So anything that adds to the DLR on the way down assists the surface spectra. This is not the case for very strongly emitting regions – see the region around 500 cm-1. The boundary layer emits and absorbs due to water vapor so strongly in this wavenumber region that incident radiation from above is irrelevant to the surface measurement. The bottom right graph is just the top layer in the top right graph shown separately for clarity. Most people’s untrained intuition about how different radiatively-active gases (=”greenhouse” gases) in different concentrations at different locations change the interaction of radiation with the atmosphere are wrong. Intuition needs to be informed by measurement and theory. It’s just not an intuitive subject. We’ve seen that water vapor can have very different effects on TOA radiation and the surface. And we’ve seen that water vapor in different places has very different effects. Also we’ve seen the difference between a dry and saturated atmosphere. 1. 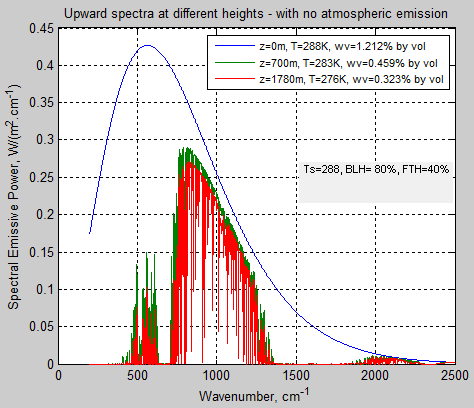 On a technical note – this model has at least one important flaw, which is to do with how absorption lines change near the top of the troposphere – the Voigt profile vs the Lorenzian profile. The Voigt profile is not yet implemented because when I last looked at it it made my head hurt trying to implement it in a useful manner (my attempt at the Voigt profile turned a surprisingly fast model given the 287,000 lines calculated in each of 10 layers into a bucket of sludge). I am going to have another crack at this headache-inducing puzzle before trying to do lots of “what happens when CO2 concentrations are changed by small amounts” scenarios. Actually, if there are any maths whizzes out there who would like to do the heavy lifting – or even just explain what seems simple to someone who has forgotten almost all maths ever learnt – please let me know here or via email at scienceofdoom – the usual bit – gmail.com. Probably you will get your name on the top of one of the graphs or something, no promises on the font size yet. 2. These scenarios we have seen are all from a “snapshot” of the climate in 1D without running it to a new equilibrium. Obviously if you change the water vapor from 0% to 100% the surface temperature won’t stay the same. Everything will change. When we have been comparing scenarios we have had mostly the exact same surface and atmospheric temperature. This is for a good reason. Small steps first. Actually, grasping atmospheric radiative transfer is a big step. 3. Changes in water vapor affect not just radiative transfer but latent heat and convection. The deep convection that “cranks the engine” on the important tropical circulation is from solar heating over the warmest oceans (see Clouds & Water Vapor – Part Five – Back of the envelope calcs from Pierrehumbert). Radiative transfer is just one piece of the puzzle. Most people find the actual results of radiative transfer in the atmosphere non-intuitive. Intuition is not a good guide for this topic. So a lot of misconceptions arise because the results of atmospheric physics disagree with the mental models in people’s heads. Obviously the physics must be wrong or probably climate scientists haven’t understood the basics.. Shaking of heads. For people interested in reality, read on. We are still looking at how radiation travels and interacts with the atmosphere before anything changes. There is a lot of fascination in the subject of the “average height of emission” of terrestrial radiation to space. If we take a very simple view, as the atmosphere gets more opaque to radiation (with more “greenhouse” gases) the emission to space must take place from a higher altitude. And higher altitudes are colder, so the magnitude of radiation emitted will be a lesser value. And so the earth emits less radiation and so warms up. This “average height of emission” is often supplied as a mental model and it’s a good initial starting point. Here is the result of the atmospheric model created with a surface temperature of 288K (15°C), 80% humidity in the boundary layer and 40% humidity above that (the “free troposphere). This is a cloud-free sample – clouds are very common, but really make life complicated and we are trying to provide a small level of enlightenment. Simple stuff first. The model is the same as in Part Two – but with 20 layers instead of 10. More layers just means better resolution plus a little bit more accuracy. Each layer contains roughly the same number of molecules (same pressure differential between each layer), so each higher layer is progressively thicker. The graph shows how much radiation (“flux”) makes it from the surface and from each atmospheric layer in the model to the top of the atmosphere (TOA) – [update Jan 9th, see revised graph in comments]. The TOA flux = 239.5 W/m², so what is the level where half of this value comes from below and half from above? If we include the surface and the first 5 layers we don’t have quite half (48%), and if we go to 6 layers we get just over half (51%). Layer 5 is centered at 1.9km with the top of this layer at 2.1km. Layer 6 is centered at 2.4km. 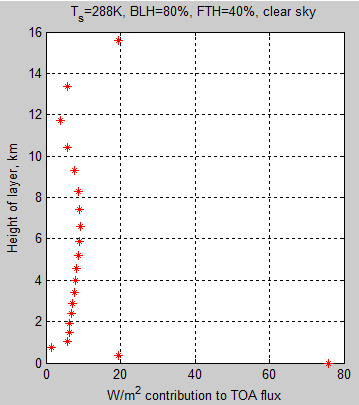 So let’s say the “average” height of emission to space is just over 2 km (in this example). Any number that is not observable and that’s not used as an input or intermediate value in any calculation that aims to produce observable results is of curiosity value only by definition. So it’s interesting but you don’t find it a key subject of any climate science papers. Still, being as so many people find it fascinating we will see how it changes as “greenhouse” gases vary in concentration and temperature profiles change. While we are looking at this, let’s see what wavenumbers from what levels make the largest contribution to the TOA flux. 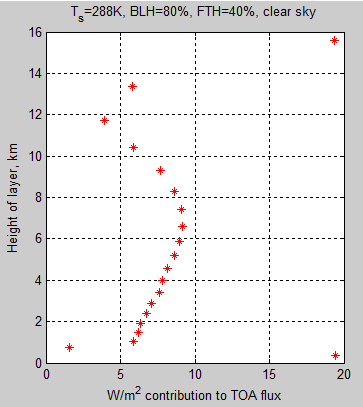 That is, let’s look at the spectral distribution vs height. We see that in the “atmospheric window” between 800 cm-1 to 1200 cm-1 the surface transmits almost “straight through” (62% of surface flux makes it straight through to the top of atmosphere in this wavenumber range). A small component comes from around the center of the CO2 band (667 cm-1) from the top layer. The rest mostly comes from the “wings” of the CO2 band and where the water vapor absorption is not so strong, around 400 cm-1. Hopefully seeing the actual data in these different ways helps to see that “average height of emission” is not a real concept or a particularly useful concept. Perhaps it’s a bit like averaging the kg of food consumed per day per person in the entire world. You get a value but the components that made it up are so wide ranging the average has lost anything useful. It’s not like average height of male 20-year olds in Latvia. Transmission and emission of atmospheric radiation is extremely wavelength dependent. We reviewed some simple concepts in Part One. 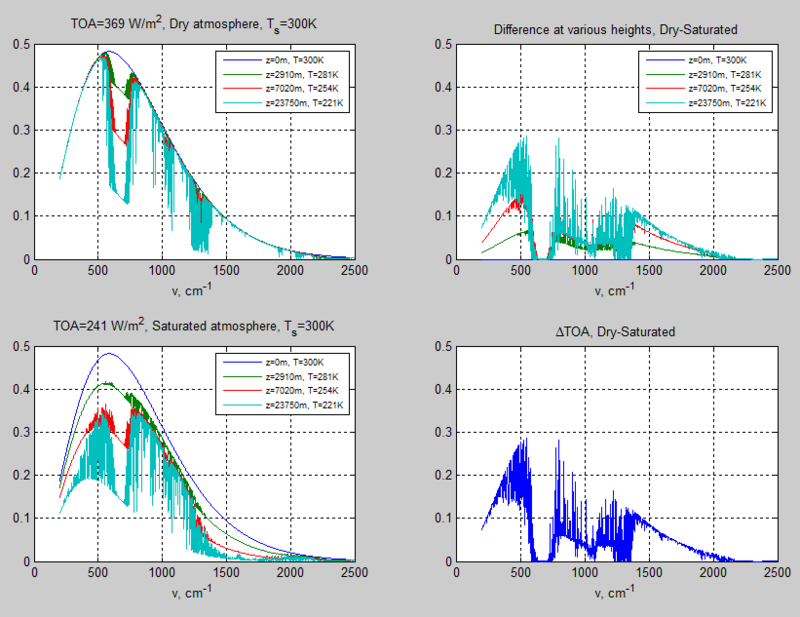 I’ve created a MATLAB model which can do a reasonable job of calculating radiative transfer through the atmosphere. More details about the model to follow, but first let’s look at an actual result and the implications. Start at the top – the blue line – this is the emission of radiation upwards from the surface. 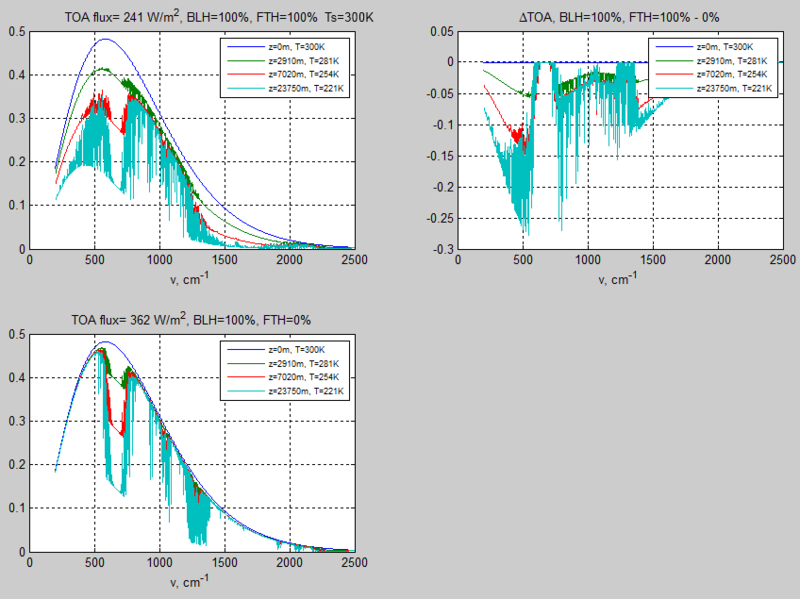 In this case, for simplicity, the surface emissivity = 1.0 (see note 2) so this is the Planck function at 288K. The next curve down is at 2800m up where the temperature has dropped to 270K. The red curve is at 6740m & 244K, and the bottom curve is at 23km & 212K, well into the stratosphere. First, the region 640-700 cm-1 (14.3-15.6μm). The upward radiation at each higher altitude (which corresponds to each lower curve in the figure) is at the Planck blackbody function for the temperature of that layer. The reason is that the incident radiation gets completely absorbed. Nothing gets out the other side. Transmissivity = 0, absorptivity = 1. It is “saturated”. But we don’t see zero radiation. Why not? The atmosphere is a strong absorber at these wavelengths, and therefore a strong emitter at these wavelengths. So each layer emits as a blackbody (in this region of wavelengths). We can easily see the temperature of the atmosphere from the Planck function if we are able to measure the radiation from these highly absorbing/emitting wavelengths. Second, the region near 850 cm-1 (below 12μm). See that the upward radiation at each altitude is almost at the surface radiation value. This is in the “atmospheric window” where the absorption is very low. The atmosphere is almost transparent at these wavelengths. So the absorption is low and the emission is low. But the starting point, if we can use that term, is the emission at the surface temperature of 288K. And so, in this wavelength region, at any point in the atmosphere the upwards radiation is close to the Planck curve of 288K. Basically, the intensity of radiation stays the same as it travels upward through the atmosphere because there is little absorption. My calculation says that of 376 W/m² of surface emitted radiation between 200 cm-1 and 2500 cm-1, 75 W/m² (20%) gets transmitted to the top of atmosphere (note 4). This is not all through the “atmospheric window” – you can see the wavelength dependence in figure 4. I calculate 61 W/m² through the atmospheric window (8-12μm), which means in that wavelength range 62% of surface radiation is being transmitted. 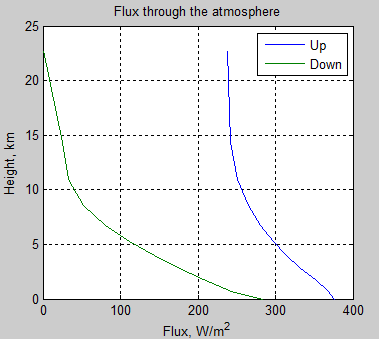 Notice that the downward flux is zero at the top of atmosphere. This is a boundary condition – there is no (significant) source of longwave radiation coming from outside the atmosphere. As we go down through the atmosphere it gets warmer and so the atmosphere emits more and more. Also as we go down the atmosphere there is much more water vapor, meaning the emissivity of the atmosphere increases significantly. So the atmosphere emits ever more radiation the closer we get to the surface. We have already considered the upward transmission of radiation. 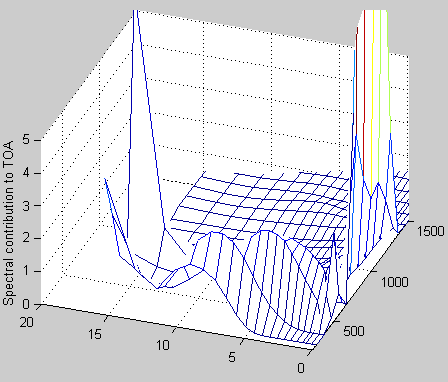 Here the blue line on the graph is simply the sum (the “integral”) of the spectral components we saw in earlier graphs. Why does the flux reduce with height? Because the absorption of upward radiation is greater than the emission of radiation upwards at each height. If this point is not clear, please reread this article and Part One – if you are confused over this fundamental point it will be impossible to make good progress in understanding atmospheric radiation. The absorptivity (the ability of the atmosphere to absorb radiation) is equal to the emissivity (the ability of the atmosphere to emit radiation) at any given wavelength. So why isn’t emission = absorption? Please ask if this is not crystal clear. 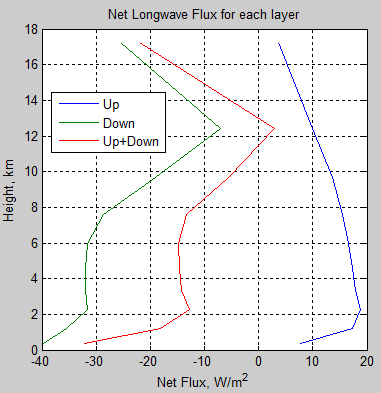 If we want to do any heat transfer calculations we need to look at how the flux changes through the atmosphere. How much radiation enters and how much leaves (see note 5). Anything different from zero for a given layer means there must be heating or cooling by radiation. (This could be balanced by convection – and by absorbed solar radiation). What this is showing is the calculation of (radiation in – radiation out) for each layer. As should be obvious from the previous figure, the upward path of longwave radiation is heating the atmosphere (more is absorbed than is emitted), whereas the downward path of longwave radiation is cooling the atmosphere (more is emitted than is absorbed). When we sum both up we find that the atmosphere is cooling via radiation. “Greenhouse” gases are cooling the atmosphere! If only climate science considered the basics! The atmosphere is not actually transparent to solar radiation and you can find similar graphs of Net Shortwave Heating per Day in many climate science textbooks and papers. The humid lower atmosphere gets a strong solar heating via water vapor. See Atmospheric Radiation and the “Greenhouse” Effect – Part Eleven – Heating Rates. My graph doesn’t actually reproduce the magnitude of the cooling rates seen for standard atmospheres – typically around 2°C/day in the lower atmosphere but I’m pleased with getting the profile quite similar – remember that the “divergence” is the difference between two values. In this case, the up and down fluxes are in the 200-400 W/m² range, while the net is around 10-20 W/m². To see what actual difference there is from a more complete model we would need to plug in one of the “standard atmospheres” and compare. The exact profile of water vapor concentration and atmospheric temperature have a big effect – something we will be looking at in detail anyway in later articles. The calculation of radiative transfer in the atmosphere can be done for a given profile without knowing anything about convection. That is, if we know where we are right now – without knowing how we got here – we can still do an accurate calculation of how energy moves through the atmosphere by radiation. If we want to predict the result of how the radiative heating/cooling changes the surface and atmospheric temperature then of course we need a model of convection – and atmospheric circulation. – and used basic theory well-known and proven for many decades to calculate the upward and downward path of radiation through the atmosphere. There’s lots to consider further. But the points and subjects in this article are all fundamental to understanding atmospheric radiation. So if anything is not clear, please ask questions. Note 1: There is a slight inconsistency in the data presentation. There are 11 boundaries and therefore 10 layers. The spectra are calculated at the boundaries. 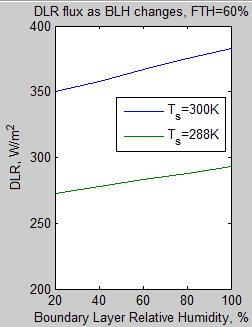 The water vapor mixing ratio is calculated in the middle of the layer. The calculation of emission of radiation is based on the temperature and the concentration of each GHG, including water vapor, in the mid-layer (the mid-pressure point in each layer) . Note 2: The surface emissivity for the ocean, for example, is about 0.96 – see Emissivity of the Ocean. In some parts of the blogworld assuming an emissivity of 1.0 is a heresy that demonstrates what these inappropriately-named “skeptics” have known all along, climate science assumes an “unphysical blackbody model of the world”! And therefore cannot be taken seriously. More exclamation marks and so on. I could have set an emissivity of 0.96 for the surface and this would have reduced the emitted upward radiation from the surface by 4%. But then for a radiative transfer calculation I would need to reflect 4% of the downward atmospheric radiation upwards (what is not absorbed or transmitted must be reflected). So in fact the upward radiation difference for the two cases (emissivity of 1.0 and 0.96) is quite small, less than 1% and not particularly useful for this calculation. Note 3: Climate science uses the conventions of shortwave and longwave radiation. Shortwave is wavelengths less than 4μm (wavenumbers greater than 2500cm-1), while longwave is greater than 4μm. 99% of solar radiation is shortwave, while 99% of all terrestrial radiation is longwave. This makes it easy to separate the two. See The Sun and Max Planck Agree – Part Two. Note 4: The emission of thermal radiation by a surface at 288K with an emissivity of 1.0 is 390 W/m². This is across all wavelengths. 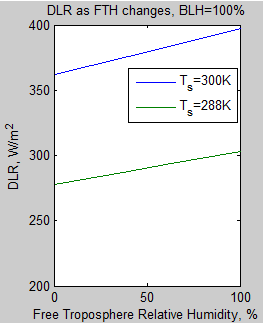 The model looks at the range of wavenumbers that equates to 4-50μm to ease up the calculation effort required. Almost all of the “missing spectrum” is in the far infra-red (longer wavelengths/lower wavenumbers), and is subject to relatively high absorption from water vapor. Note 5: If you hear the technical term flux divergence it is essentially the same thing. Flux divergence is per unit volume so it isn’t such a useful value. Instead the most common term is heating rate which divides the gain (loss) in radiation energy by the heat capacity to calculate the radiative heating (cooling) rate per unit of time (typically per day). This could be considered as a continuation of the earlier series – Atmospheric Radiation and the “Greenhouse” Effect – but I’ve elected to start a new series. It’s clear that many people have conceptual problems with the subject of what is, in technical terms called radiative transfer. That is, how radiation travels through the atmosphere and is affected by the atmosphere. The yellow spectrum shows what we would measure from one of the sides. Note that the transmitted radiation that goes from left to right has no effect on this yellow spectrum (except in so far as absorption of the incident radiation affects the temperature of the gas). If we increase the length of the box (left to right) – and keep the density the same – the transmitted radiation from the right side would decrease in intensity. If we reduce the length of the box (again, same density) the transmitted radiation from the right would increase in intensity. But the emitted radiation from the top is only dependent on the temperature of the gas and its emission/absorption lines. And the temperature of the gas is of course affected by the balance between absorbed and emitted radiation as well as any heat transfer from the surroundings via convection and conduction. Hopefully, this is clear. If anyone thinks this simple picture is wrong, now is the time to make a comment. Confusion over this part means that you can’t make any progress in understanding atmospheric radiation. Scattering is insignificant for longwave radiation (4μm and up). Stimulated emission is insignificant for intensities seen in the atmosphere. How does radiation travel through the atmosphere? 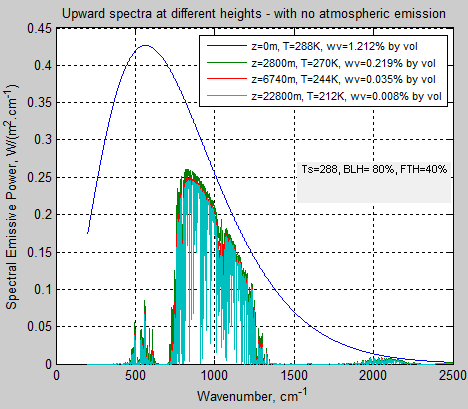 The idea shown here is a spectrum of radiation at different wavelengths incident on a “layer” of the atmosphere (see note 1). The atmosphere has lots of absorption lines of many different strengths. As a result the transmitted radiation making it out of the other side is some proportion of the incident radiation. The proportion varies with the wavelength. The atmosphere also emits radiation, and the emission lines are the same as the absorption lines. More about that in Planck, Stefan-Boltzmann, Kirchhoff and LTE. However, the emission depends on the temperature of the gas in the layer (as well as the absorption/emission lines). But the absorption depends on the intensity of incident radiation (as well as the absorption/emission lines), which in turn depends on the temperature of the source of the radiation. So in almost every case, the sum of transmitted plus emitted radiation is not equal to the incident radiation. By the way, the spectrum at the top is just a raggedy freehand drawing to signify that the outgoing spectrum is not like the incoming spectrum. It’s not meant to be representative of actual intensity vs wavelength. And – it’s a two way street. I only showed one half of the story in figure 1. The same physics affects downward radiation in exactly the same way. To calculate the actual transmission of radiation through the layer we simply work out the transmissivity, tλ, of the layer at each wavelength, λ (tλ simply indicates that t will vary for each value of λ we consider). We do that by looking up values calculated by spectroscopic professionals. These values are per molecule, or per kg of particular molecules so we need to find out how much of each absorbing gas is present. 1. The incident radiation making it through the layer = Iλ x tλ – for example, it could be 90% making it through, or 20%. 2. The “new” radiation emitted from each side of the layer equals the “Planck blackbody function at the temperature of the layer and the wavelength of interest” x Emissivity of the gas at that wavelength. In case people are interested this can be written as Bλ(T).ελ, where ελ = emissivity at that wavelength, and Bλ(T) is the “Planck function” at that temperature and wavelength. Well, emissivity = absorptivity (at the same wavelength) and absorptivity = 1-transmissivity, so the same equation can be written as Bλ(T).(1-tλ). Perhaps (the Planck function showing up in an equation) this is where many blogs (Parady blogs?) get the idea, and promote and endorse the idea, that climate science depends on the assumption that the atmosphere emits as a blackbody. There are some cases where the atmospheric emission is not far from the “blackbody assumption” (e.g., in clouds), but that is due to reality not assumption. There is no “blackbody assumption for the atmosphere” in climate science. But there is a movement of people who believe it to be true. Misleadingly, they like to be known as “skeptics”. So it’s not really that hard to understand how radiation travels through the atmosphere. It is difficult to calculate it, mostly due to having to read a million absorption lines, figure out the correct units, get a model of the atmosphere (temperature profile + concentration of different “greenhouse” gases at each height), write a finite element program and work out a solution. But that is just tedious details, it’s not as hard as having to understand general relativity or potential vorticity. One important point – it is not possible to do this calculation in your head. If you think you have done it in your head, even to a close approximation, please go back and read this section again, then look up all of the absorption lines. Still convinced – post your answer in a comment here. In the next article I’ll explain radiative-convective models and show some results from the atmospheric model I built in MATLAB which uses the HITRAN database. Now that we have a model which calculates realistic values for emission, absorption and transmission we can slice and dice the results any way we want. Does water vapor mask out the effects of CO2? What proportion of radiation is transmitted through the atmospheric window? What is the average emission height to space? Note 1 – What is a layer of atmosphere? Isn’t the thickness of this layer somewhat arbitrary? What if we change the thickness? And doesn’t radiation go in all directions, not just up? In typical physics terms the actual equation of “radiative transfer” is a differential equation, which expresses continual change. In practical terms, solving a differential equation in most real world cases requires a numerical solution which has finite thicknesses for each layer. People trying to solve these kind of problems usually check what happens to the solution as they go for more of thinner layers vs less of thicker layers. There is a trade-off between accuracy and speed. Radiation does go in all directions. The plane parallel assumption has very strong justification and – in simple terms – mathematically resolves to a vertical solution with a correction factor. You can see the plane parallel assumption and the derivation of the equations of radiative transfer in Understanding Atmospheric Radiation and the “Greenhouse” Effect – Part Six – The Equations.